Community is at the heart of this public art installation. 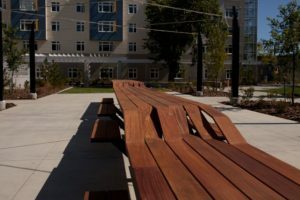 “Community Table,” provides a meeting place for the people who live in the YMCA Welcome Village, use the Boyle Street Community League facilities, or simply enjoy watching the seasons pass in the Plaza’s grounds. The work reflects the ongoing animation and revitalization in Boyle Street and the Quarters. Boyle Street represents Edmonton’s culturally diverse past and future and aspires to be a destination for people living outside the area. Tomnuk’s designs, which incorporate simple, minimalist lines, emphasize practicality and durability as much as beauty. The 22-metre-long table can seat up to 55 adults in a configuration that is sculptural and elegant. However, the materials were chosen for their ability to withstand Edmonton’s changeable weather. Tomnuk expects the table could last for up to 100 years and that normal wear and tear will just add a patina that tells the story of the community and the people in it.